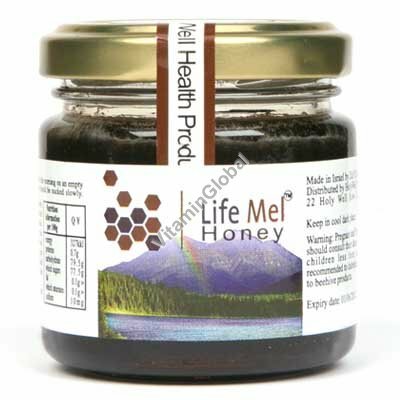 Life Mel (LifeMel Honey) for treatment of the side-effects involved in chemotherapy and radiation treatment. Click here to go to the economy 3-pack page! This medicinal Life Mel honey is an innovative groundbreaking product for treatment and support of patients suffering from acute malignant illnesses and their respective side-effects. This honey is intended for prevention and treatment of the side-effects involved in chemotherapy and radiation treatment. An increase in white blood cell count. An increase of hemoglobin in the blood. An increase of blood platelet count. Significant improvement in the overall feeling of patients. Improvement in patients' quality of living. The medicinal properties of Life Mel have been proven in clinical experiments. The results of the study were published in the prestigious medical journal Medical Oncology, and are unequivocal: LifeMel was found to be both safe and effective. Take one teaspoonful (5cc) in the morning, on an empty stomach, and one teaspoon (5cc) at night before sleep. It is recommended to sip LifeMel slowly (1-2 minutes) to ensure full absorption into the bloodstream. The dosage can be increased to a maximum of 4 teaspoons (20cc) a day. The improvement in blood profile, overall feeling, and in quality of life, will be felt after 5-10 days of treatment. Life Mel - Chemo Support Honey contains medicinal herbs, such as: Siberian Ginseng, Echinacea, Uncaria and other plants, as well as natural bio-active materials, such as: iron, protein, enzymes and vitamins, which are needed for regularization of the immune system. The active ingredients in LifeMel are absorbed directly in the blood; they stimulate blood-cell production, increase the quantity of platelets and raise the level of haemoglobin. With the exception of preparing the bee-feed mixture, collecting the medicinal honey from the hive and packaging, there is no human contact in the production process, and no ingredients are added to LifeMel after the extraction of honey from the hive. Eleutherococcus Sentic (Siberian Ginseng), Taraxacum Off, Ficus Carica, Vaccinum Myrtillus, Trifolium Pratense, Morus Alba, Chicorium Int, Beta Vulg, Inula Helenium, Ribes Nigrum, Melissa Off, Calendula Off, Urtica Dioica, Avena Sativa, Echinacea Purpurea, Uncaria Tomen. Diabetes sufferers should consult with their doctor about a slight increase in their insulin intake to balance the use of the LifeMel honey and/or diet changes such as reduced carbohydrates. People who are allergic to honey should not take Life Mel - Chemo Support Honey. Kosher under the supervision of the Badatz Eidah Charedit. Life Mel customers, please note that in rare cases you may receive one or more bottles with a small amount of honey leaking from the area of the seal around the cover. If this should happen, there is absolutely no problem. This phenomenon can happen because Life Mel is not vacuum packed, such that air pressure changes during international flights can force out a bit of honey, especially if a jar has more than the listed 120 grams. Being a natural antibiotic, there is no chance of the honey turning rancid, in or out of the bottle. Simply clean up the jar and use as per the directions. To be clear, there are no refunds or compensation for such minor leakage. Please note that Zuf Globus Ltd., the manufacturer of LifeMel honey, currently packages their product in glass containers which are not insured by USPS or the other postal courier services. Vitamin Global goes to extra lengths to cushion jars of LifeMel sufficiently, but breakage is a possibility. Please take this into consideration when ordering LifeMel as there is no refund for Lifemel jars that arrive broken or damaged. We sincerely apologize for this situation, and we hope that in the future LifeMel will be distributed in stronger containers and/or that insurance will become available for such deliveries. Thank you for your understanding. I would like to thank you for your product, Life Mel honey. This is the third time I am coping with cancer and undergoing chemotherapy. Needless to say, those treatments are very hard on the body and that their side-effects are harsh. The same week that I started to use Life Mel honey, the weakness was not so severe and I could get out of bed every morning, and cook and function as a mother to my children. The itching in my body was completely gone, I did not have any limb pain, and my hemoglobin level kept going up. With those remarkable results no one can argue. I warmly recommend to anyone that is unfortunate and must get those terrible chemotherapy treatments to try this miraculous honey; I have already received many thanks from people I told about LifeMel. Note: The information contained on this page is not of an official nature. In the event of a medical condition, any decision to use alternative treatments should be taken with the advice of your family doctor or other healthcare professional. My grandfather has been diagnosed with prostate cancer and had been undergoing treatment for years. Earlier this year his red and white cell counts became unstable so I started doing research and saw this product. All I can do is thank God for finding this. Since he started taking this his counts are remarkable, he has gained all of his weight back (plus some), and feels great. I would HIGHLY recommend this product and Vitamin Global's prices and service can't be beat. I am in the US and always receive my merchandise in less than 1 week. The fastest I received it was 3 days. Thanks for providing such a wonderful product. Date Added: 09/08/2008, by Savita W.
Just a short note to say a big thank you for your excellent service provided. My daughter is having extensive chemotherapy for cancer and after reading an in depth article concerning Life Mel honey and the improvements it can bring to people recovering/having chemotherapy, we decided to get her some. However, the cheapest we could find it in the UK was £45/jar. I then searched the internet and found your site for the same product at £26.80 a jar. A huge difference! I cautiously ordered six jars, not really sure if I was doing the right thing and would I ever see the product due to your location in Israel. How wrong could I have been! I ordered on the Thursday afternoon and the package arrived at my home the following Tuesday morning! Fantastic service and I will definately be purchasing more products from your company. Once again, a big thanks to everyone. Date Added: 03/15/2008, by Garry H.
I am undergoing chemotherapy for pancreatic cancer and after the first session my blood counts were too low and I had too cancel the 2nd session until my blood counts came up to levels which allowed me to continue with the chemo, when a relation told me about Life Mel Honey, I have been taking the Life Mel honey on a regular basis and since then I've had no problems as the blood counts have been sustainable and allowed me to continue my chemo without interruption. I HAVE NO CONNECTION TO THE COMPANY OTHER THAN AS A SATISFIED CLIENT. Date Added: 09/23/2007, by Alan S.
My other half is very poorly and I am trying everything I can to help. Having read the reviews on the LifeMel honey I started him on this daily. It is very expensive so I shopped around on the internet - despite being unsure about buying from abroad I was delighted with the results. The service was easy to use, the product came in 2 days!! and at a really excellent cost. Customer Service - A1!!! and I will be using them again. Date Added: 08/13/2007, by Alicia H.